The popular orchestra is now in residence at the BMC and returns to the stage with oboist Jennifer Slowik. A second performance is set for Sunday, Sept. 30, at 3pm. 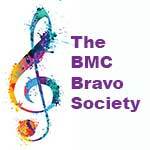 The popular orchestra is now in residence at the BMC and returns to the stage with oboist Jennifer Slowik. A first performance is set for Friday, Sept. 29 at 7:30pm. "A Taste of the BMC" is set for Saturday, April 6, from 11 a.m. to 1 p.m. at the Brattleboro Country Club, 348 Upper Dummerston Road, Brattleboro. Our annual fund-raiser will include brunch, music and a silent auction, with various artwork, goods and services donated by area business and individuals. There will be many items to choose from, so mark your calendar! Call the BMC at 802-257-4523 by April 2 to reserve seats today!